The Dedee Shattuck Gallery is pleased to present Fields of Visions, work by photographers Millee Tibbs, Carsten Meier and Jimmy Fike. The genre of landscape in art and photography has long been associated with the Romantic Tradition—an approach that translates the forms of nature into symbols for the artist’s emotional state while propagating mythic ideals of gender and conquest. A symbolic language around this aesthetic emerged over the years, one that converted the environment into an emotional register—its most common forms being landscape as beautiful, pastoral, sublime or menacing. The usage of appearance (landscape) over process (ecology) in art made the genre easily co-optable by the tourist industry and marketed to suburbanites. As environmental degradation increased and the environmental movement formed, it became obvious that the Romantic approach was reaching its limits. In postmodernism, this trajectory reached its nadir in landscape-as-kitsch (calendars, mouse pads, posters, Bob Ross, scenic views with signage, etc.). Out of these ashes the inverse emerged, as photographers in the New Topograhics worked with a decidedly non-romantic eye. These ironic existentialists saw the fatalism, the cracks in the mythology and insurmountable encroachment of development into wild spaces, documenting it with an unflinching deadpan. While the work served as important reality check and opened up a space for critical theory that deconstructed the relationship between patriarchy, psychology, capitalism, colonialism and landscape its aesthetic of alienation and implicit belief in photography as window to the world seems incomplete – this is where the photographers on display pick up the baton. The artists in Fields of Visions have eschewed both the overly sentimental, highly aestheticized nature of the romantic tradition and the detached fatalism of the New Topograhics. 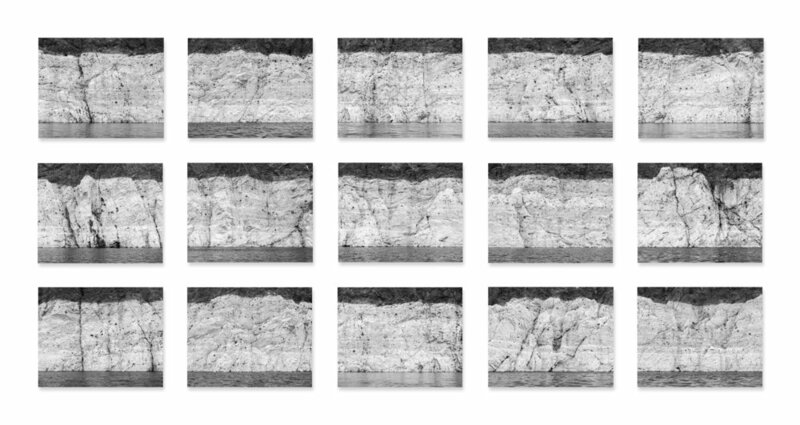 Hoping to create a contemporary type of landscape photography that incorporates ecology, complex systems of digitized sight and dissemination, heightened perception, theoretical critic of orthodoxy within the genre, and influences from socially engaged practice. 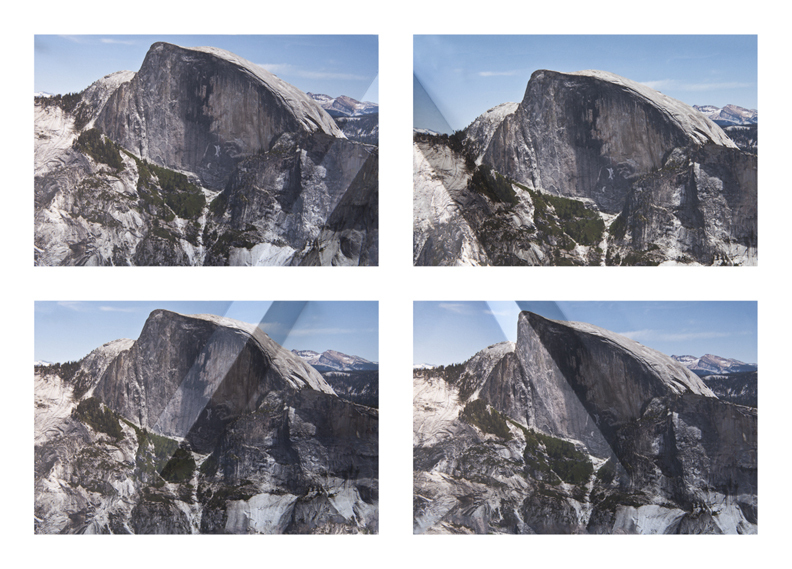 Tibbs, Meier, and Fike each bring a unique vision and approach but are bound by a common desire to see landscape reinvigorated and each uses layered systems of photographic presentation to achieve these ends. By layering information on top of images each present a multifaceted interface that extends photography into new realms of discourse and invites new forms of perception. Within my system the plant is excavated, arranged in the studio, photographed, then illustrated digitally in such a way as to render the edible parts in color while the remaining parts, less emphatically, read as contact prints. 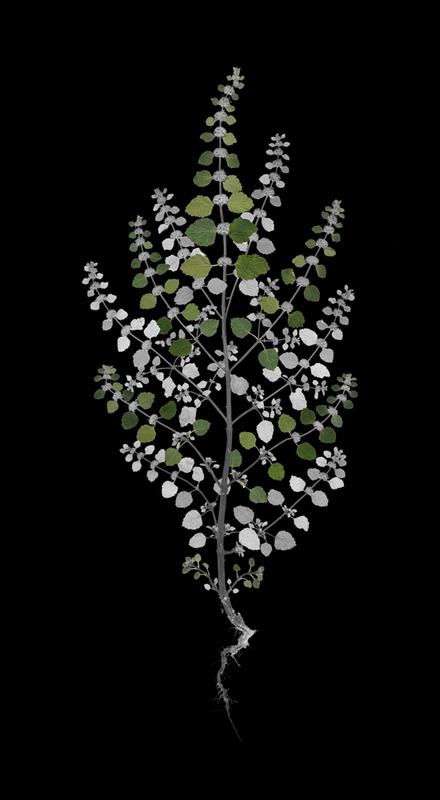 The plants in the resulting images float in an infinitely black expanse, referencing both photograms of botanical specimens used as scientific illustrations and visions from the collective unconscious. I strive to create images that function as conduits in a uniquely charged space connecting art, science and spirituality. While this type of art may appear atavistic and indeed references historical approaches to understanding and utilizing nature, its redeployment, in this contemporary era, is vitally relevant to environmental issues. These edible plants grow all around us, in yards, alleys, ditches, and empty lots. Each testifies to our symbiotic evolution with all of life, and functions as both poetic metaphor and concrete proof of our intimate tether to the natural world. It is my hope that this art foments contemplative wonderment by offering viewers both information and insights that if realized kindle a reconnection to the natural world and a mystical counterbalance to scientific objectivism. I prefer mounting exhibitions that feature plants found within that same community. My place-based approach to photography signals an interesting shift in configuring the medium’s relation to subject, audience and site. My work actively engages the community by utilizing relevant contextual information, interdisciplinary research, and an elegant if slightly spellbinding aesthetic. These elements all work together to offer knowledge and conjure a glimpse of deeper ecological truths. My layered approach to creation offers multiple entry points and a diverse range of engagement. Currently, I’ve photographed over one hundred forty plants in fifteen different states and plan to continue the survey until I’ve created a collection that spans the continental United States. Jimmy Fike was born on a cold December morning in Birmingham, Alabama. He received a BA in Art from Auburn University and earned an MFA in Photography from the Cranbrook Academy of Art under the tutelage of Carl Toth. Jim has taught art at Wake Forest and Ohio Universities and is currently an Art Faculty Member at Estrella Mountain College in Avondale, Arizona. His photographic work endeavors to find creative, contemporary ways to approach landscape by incorporating place, identity, ecology, and mythology. His series on wild edible plants has been exhibited in a number of shows across the county, featured in the L.A. Times, and can be found in the permanent collection of the George Eastman House Museum. When not creating art or teaching Jim enjoys reading, cooking, picking guitar, and hiking with his dogs Sallie and Scrappy Doo. My recent work expands several lines of inquiry that I have been developing throughout my artistic practice: an interest in the photograph as a three-dimensional object; the limitations of the photographic image to present a straightforward documentation of reality; and photography’s role in the production of iconic imagery, which, through its simplification of the subject matter and overuse, becomes cliché. I am particularly interested in the space where the authentic meets the constructed, and the real and the manipulated overlap. My work has evolved into an investigation of idealized landscape imagery - the kind that is easily consumable and often commodified. I am fascinated with the landscape genre and its language, the aesthetic imposed onto the land through photographic framing, and the historical rhetoric inherent in these images that justified Manifest Destiny and conquest through what is left out—namely inhabitants. Through my work I address the perpetuation of a visual language rooted in expansionist ideologies as well as the gendered gaze that heroicizes the photographic possession of this landscape. Cutting, folding, and sewing onto photographs, and moere recently darkroom manipulation, are gestures that I use to break the surface illusion of these images and draw attention to their artifice. By reintroducing the hand into these images, I reiterate that there is little untouched in these spaces. Millee Tibbs’ work derives from her interest in photography’s ubiquity and the tension between its truth-value and inherent manipulation of reality. Tibbs is an associate professor of photography at Wayne State University. She holds an MFA in Photography from the Rhode Island School of Design. She is the recipient of two MacDowell Colony fellowships, as well as multiple national and international artist residencies awards. Her work has been published and exhibited internationally, most recently at Pingyao International Photography Festival, China, and at the George Eastman Museum, NY. I am most fascinated by Photography’s relationship to authenticity, and my creative process employs the medium to make landscapes virtually tangible. Many years back, I researched the historical development of the environmental movement in the United States and learned that the building of dams and flooding of picturesque landscapes, essentially driven by the progress of civilization, was a catalyst for the environmental movement itself. 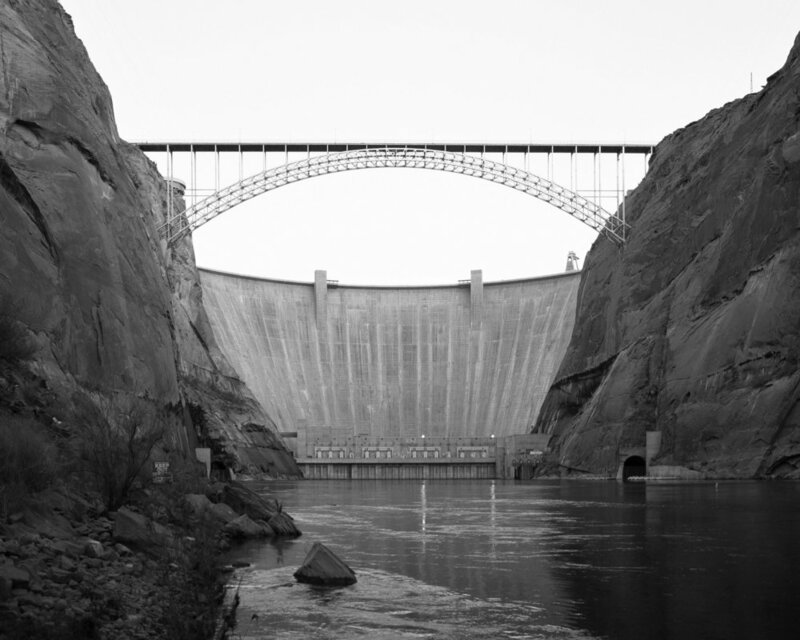 With the hope that the collected photographs of dams and their resulting reservoirs would make this connection visible, I started to photograph these structures in the United States and Europe. Since 2010, my work has included photographing concrete arch dams, which I selected for their universality in the landscape and for their direct connections to architecture. 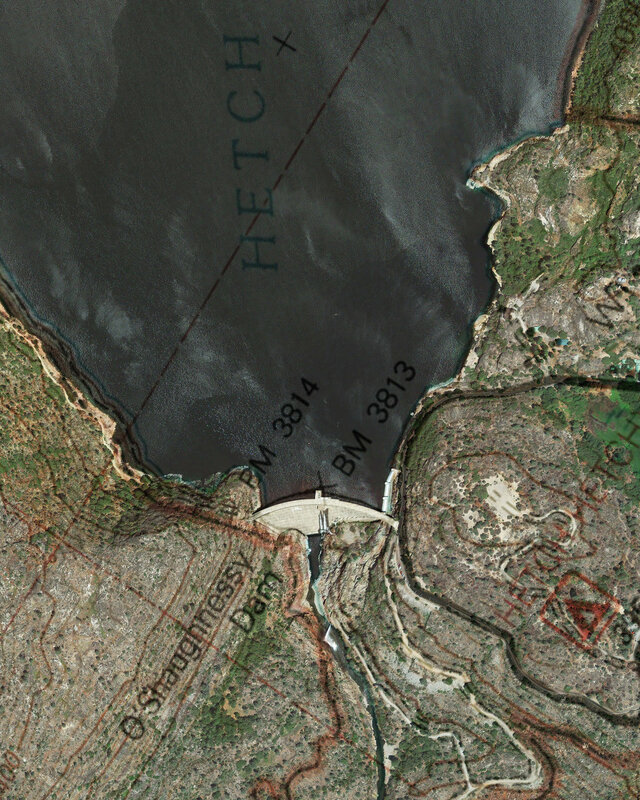 I have further experimented to create new works using my own photographs and images from public sources including Google Earth and United States Geological Survey (USGS) topographic maps. Research of dam sites and reservoirs also led me to expand my focus to sediment deposits on canyon walls, that are visible when the water level is exceedingly low, as it has been for several years in many parts of the American West. 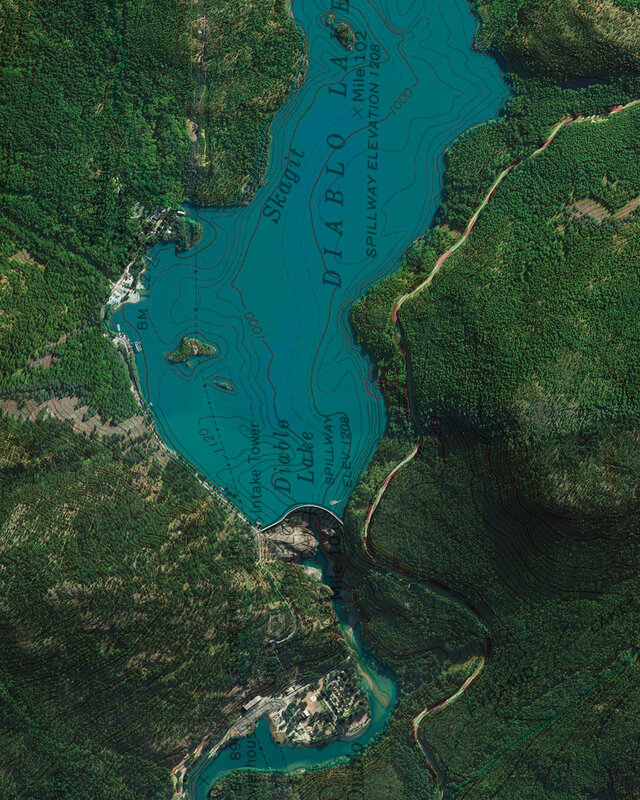 As the dam itself is both an object of beauty and of contention, the images of sediment deposits document the consequences of establishing reservoirs by revealing what was lost,while their broad strokes of shade and line simultaneously appear like enormous and unconscious paintings of our own actions. 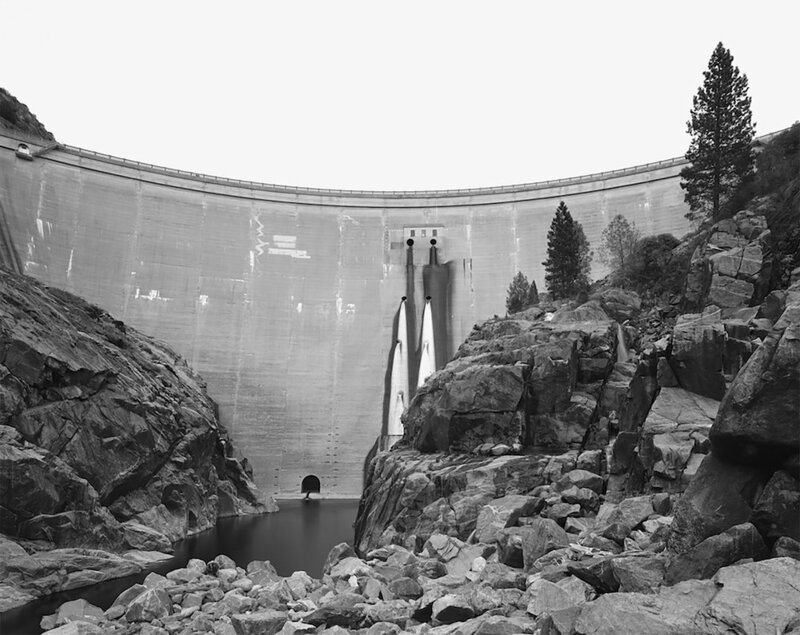 Collectively, these photographs magnify the impact of human intervention on the landscape, just as a dam is a literal interruption to the landscape. Ultimately, my photographic work seeks to both connect and disrupt conventions of photography, particularly the way it has been historically used to document the progress of industry. This project is a response to the relevance and ever-increasing attention pointed at water management, particularly important in the West. One need only look to headlines concerning drought, decommission, and the recent evacuation at Oroville to more fully appreciate the significance of these long overlooked structures that are capable of balancing architectural allure with the strength to stop rivers just as they visually represent the dichotomy between water ecology and water management. Carsten Meier is a German-born photographer known for his large-format renderings of urban and natural landscapes. His work has been collected and exhibited in the United States and Europe, reviewed by international press including Die Zeit and The Washington Post, and published in his monographs Public Parking (2005) and Dam (2015). Meier came to the States on a Fulbright and went on to earn his MFA at Ohio University. He began his teaching career at the Volkshochschule Dortmund and was an Assistant Professor at the University of Miami before joining the Department of Art + Design at Utah State University in 2011. His research often intersects with the natural sciences, and Meier is part of a team that was awarded a 2014 National Geographic Grant. In recognition of his success advising student research proposals, Meier was named the 2015 Caine College of the Arts Undergraduate Research Mentor of the year.